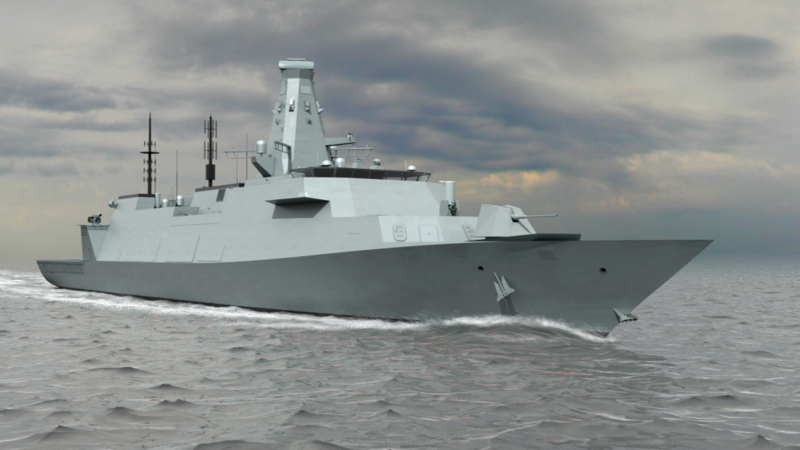 Concept image of the Type 26 Global Combat Ship. In 2020, the first of the new Royal Navy frigates – the Type 26 Global Combat Ships – will enter service, replacing the current fleet of 13 Type 23s. The ships are designed to be versatile and adaptable, making them useful within a broad range of strategic, operational, and tactical circumstances. The First Sea Lord, Admiral Sir Mark Stanhope, said of the ships: “The T26 Global Combat Ship (GCS) will be a multi-mission warship designed for joint and multinational operations across the full spectrum of warfare, including complex combat operations, maritime security operations such as counter-piracy, as well as humanitarian and disaster relief work around the world… It will be capable of operating independently for significant periods or as part of a task group and will play a major role in the defence of this country for many years”1. The Minister for Defence Equipment, Support and Technology, Peter Luff, also said of the ships: “The Type 26 Global Combat Ship will be the backbone of the Royal Navy for decades to come. It is designed to be adaptable and easily upgraded, reacting to threats as they change”2. The frigates is a concept, not just a particular type of ship. It is one that emphasizes wide-ranging utility, speed and cost-effectiveness. These fundamental functions have barely changed throughout the Royal Navy’s history. This quote from blogger Gabriele Molinelli posted on the Defence Management website supports this notion, “The Type 26 is going to reverse the Type 45 situation by adopting proven, legacy solutions for 80 percent of the design, and only innovating in the remaining 20 percent. This is an effort to stay within budget and get a minimum of 13 hulls into the water. Using existing and proven solutions whenever possible does not make the Type 26 obsolete. The ship will still be a great leap forwards in capability as it will be, effectively, the first true multi-mission ship of the “age of the drones” for the Royal Navy.’3. Considering the flexible nature of these warships and their obvious utility, they are understandably an exciting prospect for the Royal Navy and will represent the backbone of the fleet of the future. But my concern is with numbers, concerns also felt at the highest levels of the military. Recent comments made by Chief of Defence Staff, General Sir David Richards, at an Oxford University talk revealed one of his biggest concerns in relation to Britain’s modern armed forces is the number of frigates and destroyers the Navy has4. We often hear talk of how advanced and flexible modern warships are, however, no matter how advanced a warship may be, numbers are of critical importance – there is quality in quantity – for a nation that wishes to retain global influence. With the Royal Navy due to commission two 65,000 tonne Queen Elizabeth-class aircraft carriers in 2016 and 2018, there is a chance of a distorted allocation of resources from the wider surface fleet. 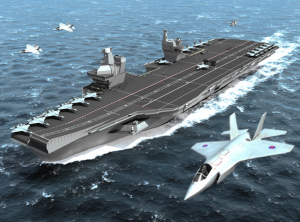 Concept image of the Queen Elizabeth aircraft carrier. A current American carrier battle-group is at a minimum often comprised of, but not limited to, the carrier itself, two guided missile cruisers, 1-2 ASW destroyers or frigates, and up to two attack submarines. To lose one of the new carriers would be unthinkable, even more so because the loss of one would halve Britain’s seaborne strike capacity (or all of it if one of the carriers is sold to the French!). It would thus be fair to assume that the Royal Navy will need levels of protection similar to that which the American Navy affords their carriers when on deployment (additional protection in time of conflict or crisis). When you consider that there will be only 6 destroyers and 13 frigates (Type 23, then 26) for the foreseeable future, factoring in periods in re-fit, ships returning from operations and the sheer importance of these assets, deployment of just one carrier would seriously hamper the Royal Navy’s ability to meet its wider global commitments. Consider the analogy of a football team; a side consisting of only a few world-class players will still struggle to compete against a full team of average players; unable to respond to every manoeuvre on the pitch. If a warship is thousands of miles from a crisis, technological superiority counts for nothing. It is all well and good having an adaptable and flexible warship, but a flexible fleet is vital. Limited numbers also means that should any ships be lost during a crisis, regenerating forces to replace those loses becomes problematic. We only need to recall the loses sustained during the Falklands; the modern Royal Naval fleet could not sustain such damage. With procurement timelines as they are (many sailors who serve on the new carriers and frigates were not yet born when they were first conceived), it is important the service fights tooth and nail to get its full allocation of 26s in the first round; the MOD and the Navy must learn from the Type 45 fiasco, where construction delays led to spiraling costs and a halving of the initial building programme of 12 ships. Unlike days of yore, we can’t acquire several new warships after an afternoon sparing with the French. In addition to the routine but important ‘kinetic’ tasks carried out by Royal Navy frigates and highlighted by Admiral Stanhope in the quote above, maintaining influence through ‘showing the flag’ missions remains of critical importance. For a nation disillusioned with liberal interventionist principles, with little thirst for future foreign policy entanglements and yet a desire, and duty, to influence events abroad, soft-power should be of primary consideration for British policy-makers; something the Navy can uniquely provide. The Type 26 will be a valuable asset for providing such diplomatic leverage. Unlike the Type 45, the Royal Navy must secure its full allocation of Type 26 warships to ensure Britain has the ability to shape events abroad, both in times of peace and conflict. Britain must not allow the fleet to shrink any further, otherwise London must accept its global influence will continue to diminish. Simon Williams received a BA Hons in Contemporary History from the University of Leicester in 2008. In early 2011 he was awarded an MA in War Studies from King’s College London. His postgraduate dissertation was entitled The Second Boer War 1899-­1902: A Triumph of British Sea Power. He organised the Navy is the Nation Conference, which was held in April 2012 in Portsmouth, UK. The aim of this event was to explore the impact of the Royal Navy on British culture and national identity. Between WWI and WWII, I believe the estimate was that the Royal Navy needed 70 cruisers. Not so long ago it was 40 destroyers and frigates. Now its 19 and in terms of personnel the Royal Navy is smaller than the US Coast Guard. Time to divert some funding back to a service with proven utility.